Because even ONE, is too many. Speak up and reach out if you know of a veteran or their family member in need. September is Veteran Suicide Prevention Month. Help us share that message that even one veteran suicide a day is one too many! If you are a veteran or know of a veteran that needs help call us now! We want all to know that veterans and their families are not alone; we provide help for health, wellness, housing and employment. 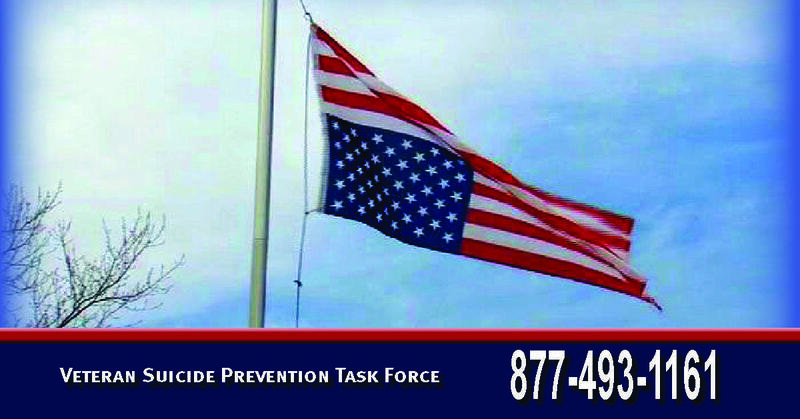 The Veteran Suicide Prevention Task Force, a coalition of service partners to help veterans and their families. The nationally recognized figure of 20+ Veteran Suicides a Day is Unacceptable! The task force goal is to reach ZERO Veteran suicides in the Sacramento region . Any Veteran (and their family) is able to obtain immediate assistance as soon as he or she has thoughts of committing suicide or desperately needs "to talk with someone"
Sensitive not only to the Veteran, but also those immediate "family" relationships which are potentially impacted by his/her condition. Gaps in services recognized as critical to Veteran mental/emotional stability are this task forces targets of opportunity to be solved. Such gaps include, but are not limited to, prevention, education, treatment, and follow-up reintegration into a local community. 8/7/2017 THIS PAGE IS UNDER CONSTRUCTION WATCH FOR MORE INFORMATION COMING SOON!!! !